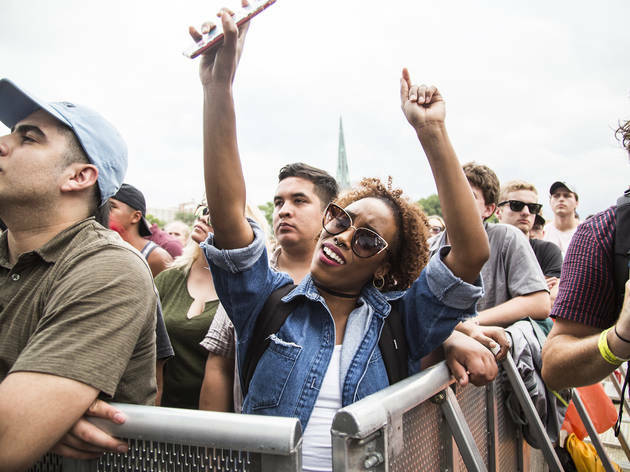 With dark clouds looming overhead and thunderstorms dotting the radar, Pitchfork Music Festival's 13th year seemed to get off to an unlucky start. Dollar store ponchos were being hawked just outside the gates as crowds began to trickle into Union Park, setting an ominous mood that thankfully didn’t materialize into anything serious. Despite a few brief downpours throughout the day, there were no stage shutdowns or evacuations. 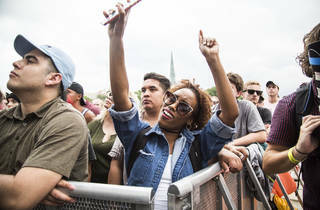 The early hours of Friday afternoon were mostly occupied by local performers, showcasing the increased presence of Chicago-based acts on the Pitchfork bill—more than have graced any previous lineup. Guests entering the fest early were treated to an eclectic set from DIY art-rockers the Curls and the raw percussive energy of noisy punk act Melkbelly. Later in the afternoon, one-time Chicagoan Julie Byrne was joined onstage by a harpist and violinist for a collection of delicate, soothing songs, while local jazz-scene veteran Joshua Abrams created a hypnotizing drone at the head of his avant-garde Natural Information Society ensemble. The afternoon’s slate of hip-hop acts was characterized by deeply personal narratives, beginning with Open Mike Eagle, who acted as his own DJ while digging into his memories of growing up in the now-demolished Robert Taylor Homes housing project on Chicago’s South Side. Across the field, West Side rapper Saba paced across a stage decorated with a fridge and a stove, echoing the photo of his grandmother’s kitchen that graces the cover of his recent album, CARE FOR ME. He dedicated his set to his late cousin and mentor John Walt, energetically making his way through a series of tracks that celebrated life while grappling with mortality. As rain continued to spit down from above, Syd sang silky R&B tunes in front of an all-white backdrop, her voice cresting atop the bouts of feedback that sporadically rumbled through the park during her time on stage. Nearby, Courtney Barnett made another triumphant return to Union Park (her third appearance in the last four years), nonchalantly belting out grunge-y anthems from her recent album, Tell Me How You Really Feel. A late-afternoon appearance from Mount Kimble proved that the often-experimental electronic act is also a capable synth-pop outfit, delivering a string of hook-filled tunes before ceding to the evening’s headliner. Confetti spewed from the stage just a few minutes into the headlining set from psych-rockers Tame Impala, performing at the festival for the very first time after years of critical praise from Pitchfork. No amount of billowing smoke, criss-crossing lasers or trippy visuals could disguise the fact that the Australian act’s woozy melodies largely functioned as background music. While a muddy and strangely quiet sound mix didn’t help matters, the din of the sizable crowd in attendance was noticeable throughout most of the show. Has the ubiquity of Tame Impala’s music on bar and restaurant playlists conditioned people to simply talk over tracks like “Elephant” and “Let It Happen”? Maybe, but it’s more likely that in spite of the group’s string of oft-played songs, it simply couldn’t muster the genuine presence needed to win over the attention of a tired and damp Pitchfork crowd.